Gearbox announced the Game of the Year edition of Borderlands recently via Twitter, to be released October 12 for 59.99 on Xbox 360, PS3 and 49.99 on PC. 3/4 of the DLC are reported to be on the disc, with the yet-to-be-released “Claptrap’s Robot Revolution” redeemable via a download token. Perhaps the GOTY Edition Strategy Guide that surfaced last month will release along side this excellent value for anyone who hasn’t experienced Borderlands yet. Not much information other than the above has been announced, though several sites are reporting that a huge map of Pandora will be included. See inside for what IGN is showing as the boxart, and the official Press Release. New York, NY – August 30, 2010 – 2K Games and Gearbox Software announced today that the superextravasplosive, mega-hit Borderlands™ will offer a Game of the Year edition this fall. Borderlands™ Game of the Yearwill be available for the PlayStation®3 computer entertainment system, Xbox 360® video game and entertainment system from Microsoft for $59.99 and Windows PC for $49.99 starting October 12, 2010. This new addition to the critically acclaimed Borderlands experience will provide fans with the ultimate outlet to lock, load and face the madness. More than 17 million unique weapons and loot empower gamers to blissfully blast their way through all of Pandora’s inhospitable environments and leave behind a bloody wasteland of indigenous monsters, zombies, Claptraps and evil corporate mercenaries. Level up with the Borderlands experience seamlessly by playing alone or with friends through extensive split-screen or online co-op integration for the most ultimate Role-Playing Shooter fun ever created. Borderlands Game of the Year edition will come with tokens for download of the recently announced add-on pack, Claptrap’s New Robot Revolution, as well as the three previous best-selling destructive downloadable adventures – the living dead-filled The Zombie Island of Dr. Ned, the ultimate video game survival of the fittest test Mad Moxxi’s Underdome Riot, and the utterly fantastic The Secret Armory of General Knoxx. Also included, will be a complete and comprehensive map of the Borderlands territories. With this definitive collection, gamers will now have the perfect chance to join in and experience what millions of Borderlands fans already adore. They’ll find a highly addictive video game that calls for unleashing furious anger upon a sinister corporation’s well-armed armada and Pandora’s local inhospitable inhabitants, while searching for the secret of The Vault that is chock full of extra bonuses and add-ons. 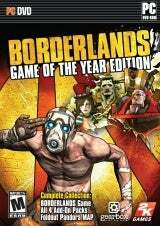 Borderlands, rated M for Mature by the ESRB, is currently available for the Xbox 360, PlayStation 3 system and PC. The Zombie Island of Dr. Ned*, Mad Moxxi’s Underdome Riot* and The Secret Armory of General Knoxx* add-on packs are all available separately on the Xbox LIVE Marketplace for Xbox 360 for 800 Microsoft Points and on the PlayStation®Network and PC for $9.99. * Requires standalone Borderlands product in order to be played. some technical issues using this web site, since I experienced to reload the site lots of times previous to I could get it to load properly.